Our club tournaments are a highlight on the club calendar. 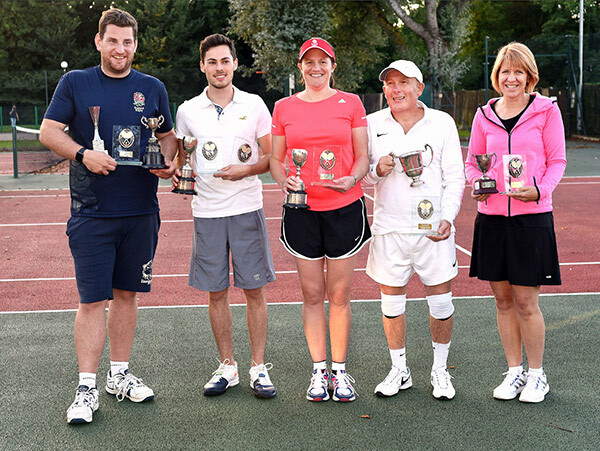 In May/June we hold the round robin stage of our Ladies Doubles, Mens Doubles and Mixed Doubles tournaments on 3 separate Sunday afternoons, to decide who will play in the finals on Finals Day in September. Partners are drawn from a hat. Part of the fun and competition is seeing how these partnerships gel and play together. We encourage as many members as possible to participate. You can sign up for the tournaments by putting your name on the appropriate list in the club house, before the closing date. An email is sent to all members informing them of the sign up and closing dates. It is not possible to just turn up on the day without signing up in advance. This is because the tournament organiser needs time to get the preparation work done for the tournament in advance, and maximise play time on the day. In addition we run singles Mens and Ladies tournaments over the summer months. This works on a knock out basis. Sign up is again by putting your name on the singles list in the club house, before the closing date. Each round has to be played before a given date, but players can arrange a mutually convenient time to play their match. The respective finals all take place on finals day in September. Visit the EVENTS page of this website to see the actual dates for this year’s tournaments.